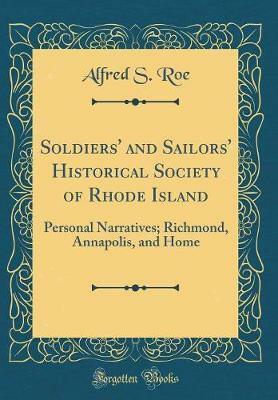 Excerpt from Soldiers' and Sailors' Historical Society of Rhode Island: Personal Narratives; Richmond, Annapolis, and Home My second revisiting was in February, 1888. Then I went purposely to see what I could of the places so prominent twenty-five years before. The Pemberton of the Rebellion had disappeared by fire, and in its place was an honest blacksmith shop where diligent toilers were earning a livelihood. Only a tradition places the old building on the site. Libby is yet standing, soon however to be transported to. About the Publisher Forgotten Books publishes hundreds of thousands of rare and classic books. Find more at www.forgottenbooks.com This book is a reproduction of an important historical work. Forgotten Books uses state-of-the-art technology to digitally reconstruct the work, preserving the original format whilst repairing imperfections present in the aged copy. In rare cases, an imperfection in the original, such as a blemish or missing page, may be replicated in our edition. We do, however, repair the vast majority of imperfections successfully; any imperfections that remain are intentionally left to preserve the state of such historical works.